Kashmir-Shaivism was until the 19th century kown as Trika . 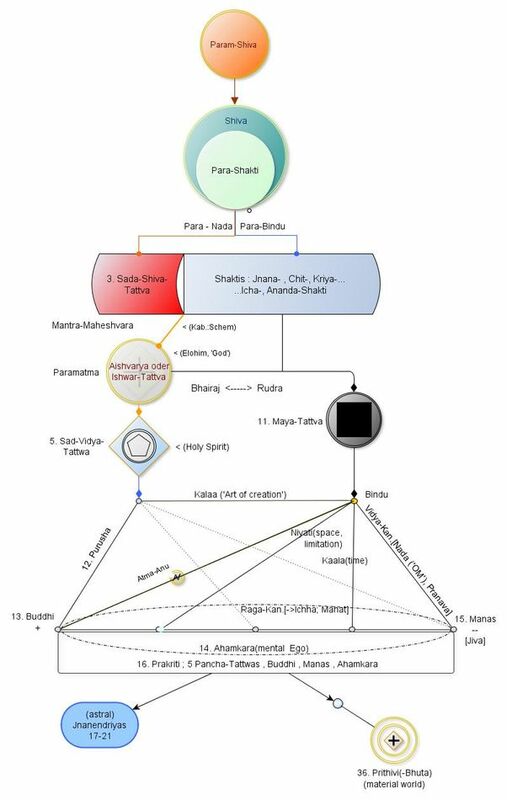 Since Abhinavagupta it is a Synthesis of several tantric scools und influences of hinduism. Therefore the Krama scool teaches the last 5 steps of the Ashtanga-Yoga and premises the first 3 steps. Kashmir-Shaivism knows the seven main-planes of creation with 36 Tattwas, while Hinduism knows only 24 Tattvas. At the top of creation stands here PARAMSHIVA (Parambrahma of hinduism is at most Sadashiva). Beyond are 5 purely divine "Tattwas" : Shiva- Tattwa, Shakti- Tattwa, Sahashiva-Tattwa, Ishvara-Tattwa, Shuddha Vidya or Sadvidya-Tattwa. These are worlds of Mahamaya. Beyond this are the Shuddhashuddha-Tattwas : Impure Maya and the 6 Kanchukas : Kalaa, Vidya, Raga, Kaala, Niyati, Purusha. They are the subtle preliminaries of the five grosser elements. In the jewish Kabbalah are similar Qliphoth or shells around the cores (Sephirot), and also Shankara spoke about the shells which surround the purusha. Beyond the Anthakarana are 24 wordly Tattwas with the 3 Gunas : Prakriti with the 3 Gunas, Buddhi, Ahamkara and Manas etc.. The four physical Elements(Mahābhutā) are : Ākāśa-Tattva, Vāyu-Tattva, Tejas-Tattva and Jala-Tattva. The "Prithivi anda" is the endpoint of creation - the fix matter, which contains only one Tattwa. Paramashiva has two aspects : Prakasha (transcendental self relevation, rest) and Vimarsha (pure non relational "I" consciousness, active). The prakasha-phase of the universe is called pralaya or resorption. Of the many powers only 5 are fundamental : chit-shakti, ananda - shakti, iccha-shakti, jnana-shakti, kriya-shakti - the main shaktis of Sadashiva. From Maharloka up to Satyaloka, 1000 revolutions of the 4 yugas constitute a day. The night is of equal length and is the time when BRAHMA goes to sleep, withdrawing the bhuloka, the bhuvarloka and swarloka into his belly (our 3 lower worlds). The cosmic spiritual BRAHMA so has a life-span of 311 040 Milliarden years. The Shivaism praises the Shiva-Mantram "Om Namaha Shivaya" and Kashmir-Shaivism uses the 'Aham'- Heart-Meditation.